Introducing MEGA MUNNY! The biggest mass produced MUNNY yet, standing at 18 inches tall! This DIY behemoth is set to become your custom toy masterpiece. Love Mega MUNNY like a child, because its about the same size as an enormous baby. 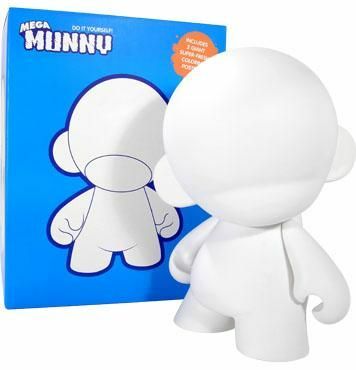 Just like with regular MUNNY, you can draw and paint on Mega MUNNY. Use crayons, pencils, finger paint, ketchup, or anything else you can think of. You can make clothes for Mega MUNNY. Make things to put in Mega MUNNYs hands! Snuggle him, pierce him, drape him, cherish him. Each Mega MUNNY comes with a mega sized practice sheet and an ilovedust coloring poster.